The Joe Ruddick Quartet (pictured) will play in Hamilton Park on July 30th. Due to multiple free concert series starting up again, the hills of Weehawken will be alive with the sound of music all summer long. Aside from the HRPAC series in Lincoln Harbor (see briefs, page 2), the free Sunday Hamilton Park Concert Series and the new free weekday concerts held at Pershing Park will kick off this week, run by the township. Whether you enjoy country or jazz, classic rock or Latin music, there will be something for every taste. Grab your lawn chair or a blanket and head out with family and friends. For weather updates on the Hamilton and Pershing series, check the Weehawken Township Government Facebook page or twitter @weehawkennj. These are sponsored by Mayor Richard F. Turner and the Township Council. 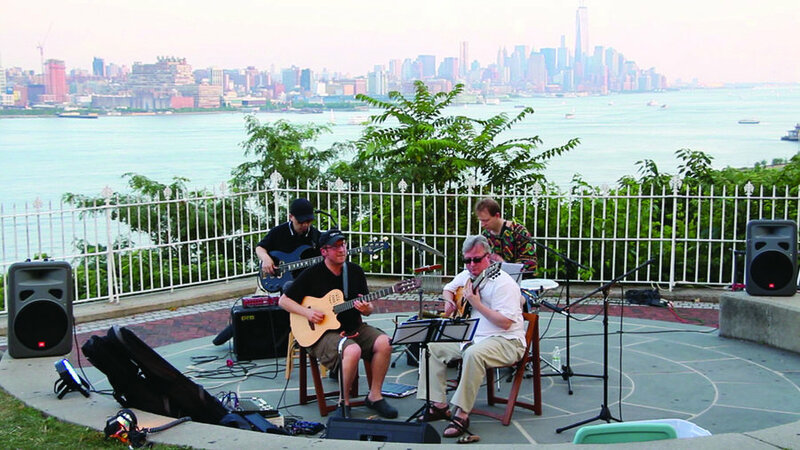 Performances in the Hamilton Park Summer Series are held every Sunday evening beginning at 5 p.m. and ending at 7 p.m. Hamilton Park is located on Boulevard East and Duer Place in Weehawken. The concerts begin on June 25 and end on Sept. 3. Opening for the Hamilton Park series on June 25 is Finish This, ’60s Rock with a Blues Edge. Inspired by early rock ‘n’ roll, classic soul and the blues, this band of seasoned professionals with deep local roots plays hits from the ’60s with some originals mixed in. The remainder of the summer schedule in Hamilton Park will include: July 9, Swingadelic, jazz and blues; July 16, Big Mamou, cosmic Cajun, Zydeco and country; July 23, Boulevard East Collective, an eclectic mix of jazz and R&B; July 30, Joe Ruddick Quartet, jazz featuring pianist/saxophonist Joe Ruddick; Aug. 6, The Annie Minogue Band, with opening act Violet, a combination of rock, pop, and blues; Aug. 13, Donna Coney Island with South Street Station, rock and country; Aug. 20, Anthony Bez, a mix of pop, rock, Latin, jazz and original instrumental music; Aug. 27, The Joni Project, fresh interpretation to Joni Mitchell’s legendary work; and Sept. 3, Zaccai Curtis Quartet, modern Latin Jazz. The Township of Weehawken will host Pershing Park Summer Concerts every other Wednesday evening at Pershing Park beginning at 6 p.m. and ending at 8 p.m., at the foot of Pershing Road. In the event of rain, the concert will be held the next evening, Thursday. Opening for the Pershing Park series on July 5 will be Flamenco Latino, a flamenco genre which includes the tangos and rumba forms of flamenco, influenced by music from Caribbean and Latin American countries. The remainder of the summer schedule in Pershing Park includes: July 19, Joe Cimino’s Rubber Room, R&B covers and originals; Aug. 2, Weehawken Jazz All Stars, composed mostly of Weehawken residents; Aug. 16, Maxima Alerta, Cuban Music fused with other genres; Aug. 30, Weehawken Singer/Songwriter Night, an array of acoustic sounds as local area musicians entertain with original music.